Somewhere along the way, we stopped calling it a hamburger. Maybe it sounds more upscale if it’s a burger. Today, in honor of that, I present my 11th attempt at the perfect burger, give or take a few times. As I dig a bit deeper into learning to cook, I continue to be reminded that sometimes simpler is better. Mix all of the ingredients, Don’t overdo it. Don’t turn the mixture into mush. Make sure the ground meat still has some texture. Start with a piece of meat roughly the size of a billiard ball and form it into a patty. Make it thick if you like or thin and broad. Remember, when you cook your burger that it’s going to shrink in diameter, but get much taller. After you make your patties, preheat your frying pan on medium heat and then reduce slightly to between medium and low. Once the pan is hot, put your burger into the pan. It should start sizzling right away. Get a drip can ready. After a few minutes, lift the corner of the burger and see if it has browned. If it has, flip the burger, Cook for one minute, and remove it from the heat and drain the fat and excess liquid into your drip can. Return the pan to the heat. Cover the burger and continue to cook until it’s finished. Don’t press down the burger with your kitchen tool. That squeezes out the burger’s moisture. You can use the “push” test with your turner to test doneness. If it’s really spongy, it’s rare. If there is no give when you press it, then it’s cooked through. I like my hamburger bun toasted, so I put mine into the toaster oven. 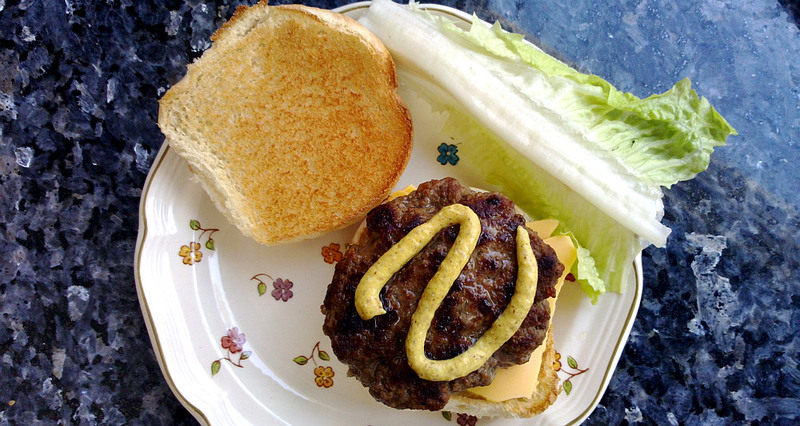 For my cheeseburger, I added a slice of American cheese, a piece of lettuce and some spicy brown mustard. That was it.